Troubled at the sight of red, bumpy rashes on your legs? You may be having Stasis Dermatitis, a medical condition caused by poor blood flow in the legs. The word “Stasis” means reduced blood flow whereas dermatitis signifies inflammation of the skin. Simply put, it is the condition where there is an inflammation or swelling of the skin because of low blood flow. This medical syndrome affects the legs and causes skin inflammation, itching and irritation. It generally happens due to circulatory problems. The condition is mostly found in the inner side of the calf. In medical terms, it is known by many names like “Varicose eczema”, “Congestion eczema,” “Stasis eczema,” “Gravitational dermatitis” and “Gravitational eczema”. 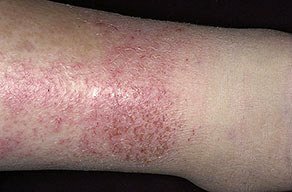 The cracked skin in the affected leg region can make bacterial infection easier and lead to other complicated skin conditions like Statis Ulcer. As mentioned earlier, the condition is caused due to poor blood circulation. In normal conditions, the blood flows from the veins of the legs to the heart. But poor circulation causes a reduction in the blood flow. This leads to a build up of fluids in the legs. The leg tissues swell due to this. When the fluids get accumulated over a period of time, they cut down blood supply to the tissues. The tissues suffer from poor nourishment due to this. The removal of waste products from the cell also becomes difficult. Naturally, the skin gets affected and weakened. It becomes discolored and thin. Bumpy skin rashes are formed that cause pain and itching. The veins in the legs become wider which causes fluid accumulation. It affects the blood supply and impacts the skin in the legs. Poor blood flow in the legs also leads to the formation of blood clots in the veins of pelvis or lower legs. This poor heart condition leads to impaired blood flow throughout the body and affects the legs. When this severe condition develops, the kidney fails to perform normally. The body wastes cannot be removed and there is an accumulation of waste fluids in the veins. Infections, kidney and liver disorders or trauma can cause this condition. It directly affects blood supply to and from the legs. Many people tend to mistake acute Stasis Dermatitis with Chronic Stasis Dermatitis. Stasis Dermatitis can be termed chronic only if lasts for about 6 months or comes and goes for a long period of time. The treatment of Chronic Stasis Dermatitis is almost the same as normal Stasis Dermatitis cases. If the affected skin area causes pain, appears red and oozes pus, it is time to consult a doctor. It is not advisable to depend only on home treatment. Lack of expert medical care may lead to serious complications in the leg such as chronic leg ulcers, bone infections or bacterial skin infections. There may also be a permanent scar in the weakened area of the skin. The treatment of Stasis Dermatitis condition is done after a proper diagnosis. Doctors observe the appearance of the skin. In some cases, tests are carried out to determine the blood supply into the legs. Once the doctor is sure of Stasis Dermatitis, treatment begins. Professional medical treatment for this disease mainly consists of medications and therapies. Generally, steroid based creams are applied on the affected skin region to improve circulation. Compression stockings are also used to push the accumulated fluids out of the legs using force. Diuretics are used to increase the flow of urine that helps to remove fluids built up in leg tissues. Topical antibiotics may also be prescribed to prevent bacterial infection in case ulcers have developed in the affected leg region. Oral antibiotics may be given if there is Cellulitis, or body tissue inflammation, in the legs. If Stasis Dermatitis is found to be caused due to Congestive Heart Failure, Kidney Failure or other complicated conditions, the doctor concentrates first on treating that disorder. Curing that complication effectively can make the Stasis Dermatitis symptoms disappear automatically. Sequential Gradient Pump Therapy is a well known therapeutic method used for Stasis Dermatitis treatment. Stasis Dermatitis can not only be cured through therapies and medications. There are also a number of ways to treat it naturally. Doctors often advise using these natural remedies side by side with medications. Some of these methods have been mentioned here. Lie down on your back. Let your ankle rest on a couple of pillows. This will raise it above the level of heart and let the blood from the legs flow back to the heart. This can be done while sitting or sleeping. If there is acute Stasis Dermatitis, clean the affected area with clean water at regular intervals. This will prevent any bacterial infection in the region. Wearing compression stockings and boots during your waking hours can help circulation in the weak region. In most Stasis Dermatitis cases, there are rashes and sores in the affected skin area. Try not to scratch it as much as possible. Scratching can damage the skin even more and make it more vulnerable to germs and infections. In severe cases, a complete bed rest is necessary. If your doctor advises you to take rest, pay heed to it. Walking improves circulation. If your condition permits, take regular short walks. Consult your doctor how much you can walk every day. A pictorial description helps a person have a better idea about a medical condition. 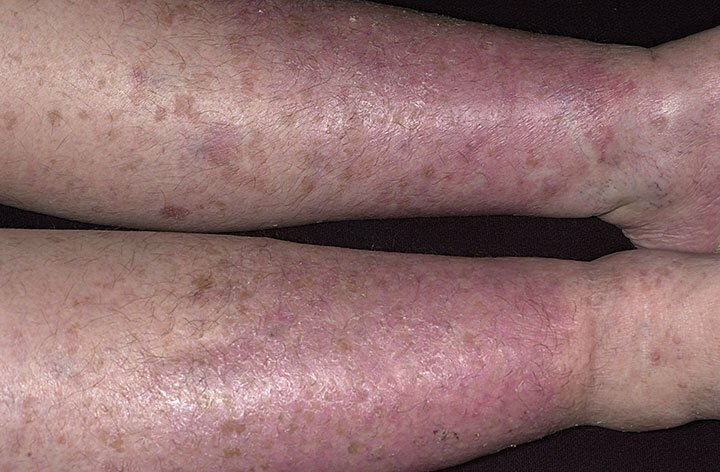 If you have doubts regarding this disease, go through these Stasis Dermatitis images and get a clearer picture about the condition. treat the condition as early as possible. I have had the purple scaly and swollen legs for some time now. I have myleodysplasia (sp) for over 6 months. At first, there were sores on my legs, my doctor saying from the low blood platelets. Then they healed and the discoloration and scales became the problem, not to mention the uneven swelling (some in an ankle and on the other leg in the calf). Yes, I have also been diagnosed with congestive heart failure, but the blood disease seems to be the prominent problem. I don’t know where to do for help, as my hemotologist doesn’t seem to have an answeer. He is presently having ultra sound done on the torso to see if there is any blockage that could cause this. Help, if you can. After CABG-5X surgery my lower left leg and to a lesser degree my right leg developed brown patches. Does CABG – especially vein removal from leg – contribute to this condition?